Resurgent dome .- The “trip” towards the resurgent dome is difficult, since is very remote, very high (~4800 m) and non populated at all, so at least two jeeps are a need to reach its summit. Getting from the northwestern side following just old tracks we reach the point view showed in pict 18. There we can see the intracaldera tuffs pounded in a sequence of at least 150 m. On picture 18 we can see the intracaldera tuffs are slightly dipping towards the NE. Following our tour we stop closer to the caldera center where a graben -like structure with blocks dipping north and south were recognized. A halo of alteration (?) 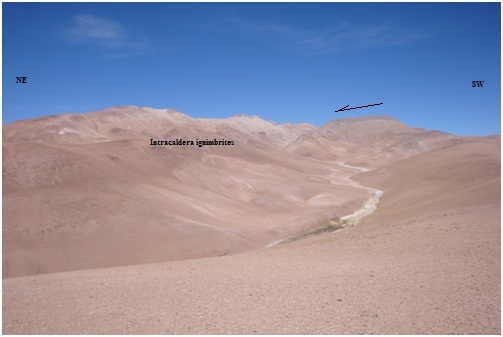 on the summit of the scarp is also observed in the distance.